I’m really not a fan of Cam Newton. But I’m going to defend him, even if few people want to go down that road right now. And when I say I’m not a fan, I mean there are few people I’d want to hang out with less. He’ll be a Florida Gator to me until the day I die, and his act can get really old, really fast. But he’s being crucified by the media, and I’m really not sure why. The Carolina Panthers’ quarterback has been a part of a 1-5 start to the 2012 season that has them sitting in dead-last in the NFC South. They’ve been atrocious, but four of their five losses have been by less than six points. Three of those five losses were to teams with four wins or more. What the Panthers really need is a leader. 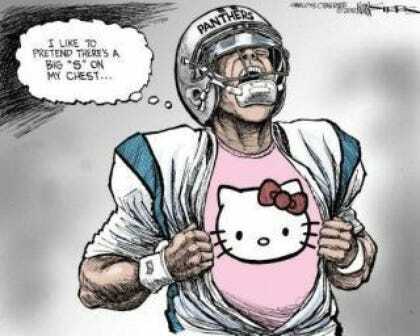 Newton never claimed to be that guy; Carolina drafted him to be an exciting playmaker who could jump-start the offense. They couldn’t have seriously believed he’d be the kind of guy Steve Smith has been on the field — someone who will grab a teammate by the helmet and jolt them into lock-step with the rest of the squad. But the media has locked in on Newton. They’ve made cartoons out of his struggles, and today, Fox NFL Sunday went after his behavior during the Panthers’ bye week. According to them, he was busy playing video games and riding go-karts during his one week off during the regular season. Better than causing trouble in nightclubs, in my opinion. I’d prefer Falcons running back Michael Turner went home to play Madden 2013 instead of driving drunk after a late night at Magic City. After their latest loss, a 19-14 defeat in Charlotte at the hands of the Dallas Cowboys, a frustrated Newton had a microphone stuck in front of him, and he went off. Told the media his team was boring. Said he didn’t want to deal with these excruciating losses. Suggested a coaching change needed to happen, whether it was offensive coordinator Rob Chudzinski or someone else. Firing season starting early: Panthers announced that GM Maryy Hurney, a classy man, has been relieved of his duties. Those aren’t ideal comments for your franchise quarterback to be making when you’re trying to right the ship, but I understand his frustration. His numbers have hardly declined from a record-setting rookie season. Newton threw for 4,051 yards in 2011, and he’s on pace for 3,693 this year. He’s just off the pace of the 21 touchdowns he threw for last season. But the Panthers are also 1-5 — exactly what they were after six weeks a year ago — so the progression everyone was so sure would catch on with the 2012 Carolina Panthers isn’t happening. Everyone is looking around for a fall guy, and it has been Newton. Now, the sophomore quarterback, who has never had to deal with losing in his life, isn’t taking it well. Posted in Football, Sports and tagged Cam Newton, Carolina Panthers, Football, NFL, Sports. Bookmark the permalink. I don’t agree with his bashing about what he does during his bye week because I’m on your side with that. The thing is, when you draft a QB #1 overall coming off of a National Championship/Heisman season he is expected to be the leader of your team. It may not be fair and he may not want that role but it comes with the territory. QB’s always take the blame when the offense isn’t performing. It has been that way forever and it will continue to be that way. I’ve never agreed with the media an the way that they bash players for things that don’t really matter and that has/is happening with Cam but the fact remains that he hasn’t performed on the field this season. His passing yards haven’t taken a huge hit but he is only on pace for 13 passing TD’s and 8 rushing TD’s which is a long way off from last season. He has also already lost 3 fumbles compared to only 2 all of last season. Yeah, but his style in college was more of a, “Get out of the way, I’m going to do this myself” attitude, like Vince Young when he was at Texas. That doesn’t make him a leader, it just makes him a freakish talent. They slapped the “C” on Steve Smith’s jersey for a reason — they knew he was the leadership on the offensive side. Maybe they hope Newton will become that leader when Smith is gone, but I don’t know if that’s fair to Cam. As far as the pace of his scoring, he turned it up in December last season (passing especially), so that’s why I think he’s on-pace. He needs to turn it up soon, though. Again, I’m not rooting for the kid or anything — he is a rival quarterback, after all — but the media seems to have locked on him, and it’s gotten a little ridiculous. I feel you on that. The media just loves a good story and Cam definitely is one. They did the same thing to A-Rod over the last few weeks. Primadona meet real world. Primadona no likey. Fire boss! I’m from North Carolina and i know exactly what you are talking about. First off, Cam might have missed a couple throws, but he didn’t have a terrible game, as he completed 56% of his passes and threw for a td. 2nd, when athletes feel the heat from the media, they feel a need to step up, so i’m looking forward to his next game vs Chicago, who has a great defense and can cause lots of turnovers. Yeah, things could go either up or down for the Panthers at this point, but they’ll need a total team effort to even stay in the game with the Bears. Big storm on tap for next week?